On the flight to Thailand – or I should more accurately say – on the crazy long, day and half trek to Thailand, I finally got a chance to read the book, When Breath Becomes Air. It is a book primarily about death, but that is full of wisdom about life. I really enjoyed it…even as it ripped my heart out. Anyway, one of the many quotes I loved is shown above. This quote and the Peace Corps mission is not so different. I am such a strong believer in the fact that people were not created to go through life alone. If I had to answer the question, what is the meaning of life? Without hesitation, I’d say it is relationships. We’re only a few days into Pre-Service Training (PST), but that is already so apparent to all of us on this journey together. We left San Francisco on Friday night west coast time. Our first flight was the long haul from SFO to Hong Kong – it was about 15 hours. 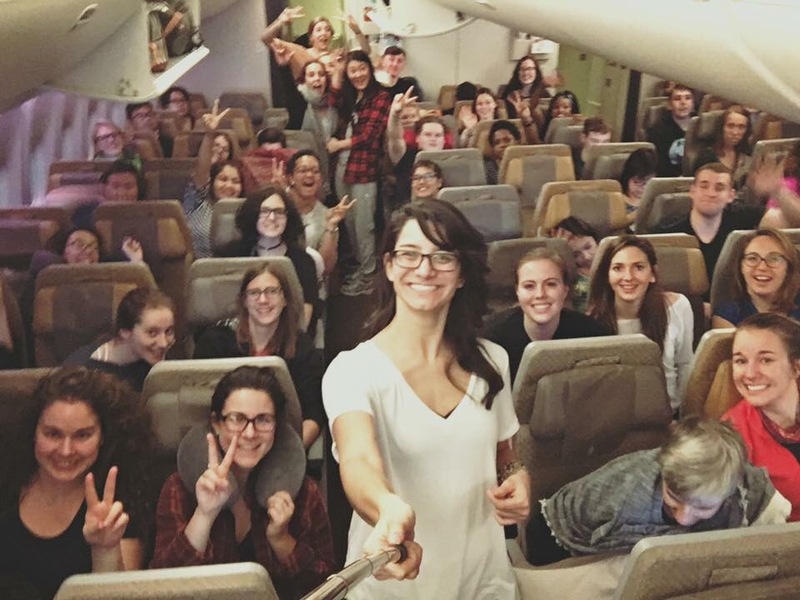 Peace Corps Volunteers (PCV’s) took up the majority of the last 10ish rows of the airplane. We finally got to stretch our legs in Hong Kong as we disembarked, made our way through security again and got back on the plane to head to Singapore. That flight was about 3 hours and then we had a 4 hour layover before the final leg. Some people found much needed showers, while others got lunch and enjoyed some time being on the ground and not in a tin can in the air. By 4pm-ish Sunday Singapore time (5pm Saturday evening west coast time), we were on our last 2 hour flight to Bangkok. We finally landed in Bangkok on Sunday evening after more than 36 hours of travel. We were greeted by representatives from the US embassy that took us through customs and helped us gather baggage, and then we were met with lei’s from some of the PC Thailand staff. It’s all a bit of a blur from there. We were gathered up, loaded luggage, hopped on busses, and made the two hour drive to Sing Buri. The community where we will be for the next 11 weeks of PST. We started trainings Monday morning and the last three days have been a whirlwind. I have been consistently impressed by the quality of both the Peace Corps trainings and staff. Every detail has been thought of and addressed. We got issued phones with Thai SIM cards, addressed safety and security, got necessary vaccinations, and started on language training. That doesn’t even scratch the surface of what we’ve taken in over the last few days. The staff members also presented each of us with a welcome card, which was the sweetest thing ever. On top of all the practical and technical details – we’re building relationships. Between ourselves as a group of new volunteers, but also with the amazing staff that has so warmly welcomed us. We’ve laughed, danced, sung, and chatted. This is only the beginning, and a number of hardships will undoubtedly come our way, but for now we get these preliminary moments to start learning about each other and about our world. Thank you so much Celete for sharing your journey and experience with us. Feels like I’m in Thailand too and can’t wait to see Asia.